What a great deal on soccer pinnies if we do say so ourselves! Buy in bundles of six and save: Simply purchase our plain soccer pinnies in packs of six per color/size, and save off our already low individual price. 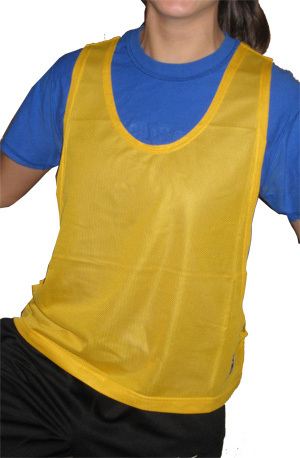 Our soccer practice pinnies (also known as soccer pennies) are made of lightweight mini-mesh polyester for extra durability. Call toll free 1-888-411-3687 or Email Us for club volume discounts, to order or for more information. We used these for tryouts and they worked out well. Quality seems pretty good, so they should last a few seasons. Sorry for the pun...couldn't resist. Seriously, good quality practice pennies. No annoying elastic around waist that rides up. Liked buying them in packs of 6 to save money. Highly recommend.